Entwined thoughts - ready to be straightened out ! : Roma in 2 days! It was the last leg of our trip and the emotions were all mixed, rightly so! The train journey from Florence to Rome was scenic. The weather was just perfect. It is one of those typical European routes where one can get excited about the Italian landscape. Our early retirement the previous day did a lot of good! We were wide awake, enjoying the beauty. We were at our B&B at 2.00 and knew we had to just run out to cover Roma!! We stayed close to the Vatican, at Bibi & Romeo. I had recommend this place, Romeo is a perfect host. He is so helpful and everything about the B&B was just so right. Even though he is not available at the B&B, he has ensured everything is set right that you will never need him, and if you do, he is just a call away! Romeo pulled out a Roma map and gave a good brief about what best can be done in 2 days. We had our itinerary, inputs from the people on ground our always helpful. We did a quick re-grouping of our plan and off we went to start our tour. 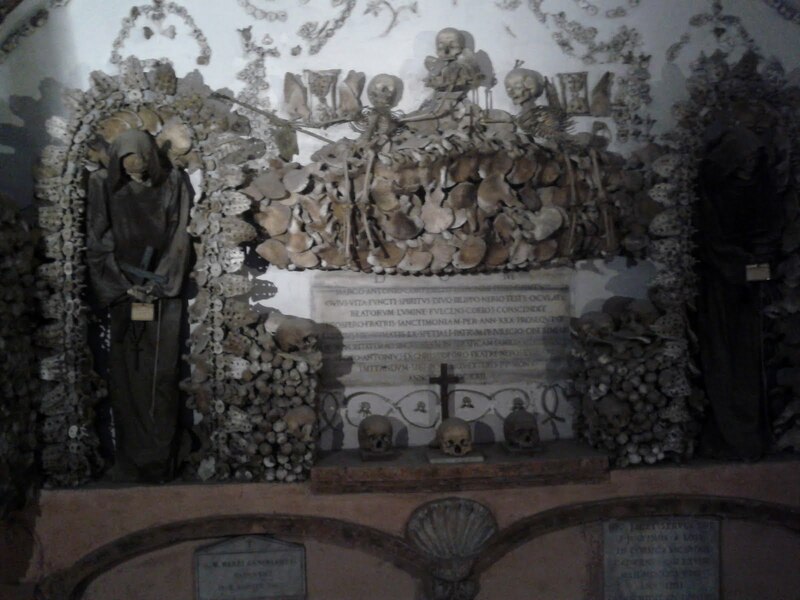 We visited the capuchin crypt where the ossuary is decorated with bones. It was first of its kind, for us in the entire trip. We began our walk for the evening from there. Our next stop was the Pantheon,(Admission free)where Raphel's tomb is placed. I found Rome to be very busy that evening with loads of people walking down the aisle. There was a demonstration in front of the pantheon, making it appear very busy and crowded. 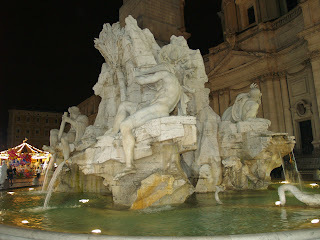 The evening was themed, "Roma for Free" for us, we next spent some time near the Trevi fountain! Bought some Pizzas and stood by the fountain. I am not sure which part of the day, the fountain would be free of tourists but an evening is definitely not the time! We stopped by at the Spanish steps, these are places where you can just sit and observe the scores of tourists around!! The piazzas in Roma are indeed beautiful with sculptures and fountains! Piazza Popello, Piazza Navona and Campo de' Fiori were are next stops. The Pyramid at Piazza Popello is the one that features in the movie Angels and Demons. The fountain of four rivers is found in Piazza Navona. The Piazzas are the ideal place to slow down, grab a cafe, take a few bites and experience Roma. Our penultimate day of the trip was planned on exploring the ancient Roma. Where else would one start but the Roman Colosseum. We spent a good 2 hours in the Colosseum!! To even stand in silence and imagine being in the days of Nero as a spectator at the Gladiatorial arena is a truly nerve wrenching experience! A walking tour through the remains of ancient Rome, at the Palatine hill and Roman Forum. Excavations are still on and many are still being studied. If you are truly interested a good guide book will be of great use. Capitol hill museum was our next destination, slowly by now, museums were becoming were becoming a bit of an overdose. 2 weeks of walking around every city was getting to us as well but here again we were in for a surprise. Every museum has something new to offer. The temporary exhibition here had put the works of Michaelangelo and Leonardo. When i say works, i mean the original study and paper works of these geniuses. A treat! Mouth of truth was our next destination for the day - a belief that the fingers will be cut off if you lie here! We ended our day with a visit to the Trastevere area, another side of Roma. I found it quieter, and more worn down as compare to Piazza Navona. We had a flight to catch at 8.30 the next day and our plan was Vatican and if possible may be squeeze one of it in but as luck would have it, there was a strike in Rome. We walked to the Vatican, first the St.peter's basilica, it appears non-impressive from the outside but very impressive as you get in - truly rich! The vatican musuem has over 1200 rooms and it is impossible to do justice - it houses Raphello's major works as well. We did our best! We had to create more buffer time as the strike was on. We headed to our man for our last mean in Italy - ate to heart's content and walked back to pick our bags to the airport! * Roma pass priced at 25 Euros is worth. The first thing we did when we landed at the train station was to pick them. * Roma Metro does not connect you well - be ready to use the bus and walk. * Gelatos in Florence are much better than in Rome. * If you are close to the vatican, try the pizzas @ 10, via andrea doria - best for the prices! * A good 3 day would be enough to cover the top attractions in Rome. Sigh! Its my dream to go to Italy.......dunno when I will make it!